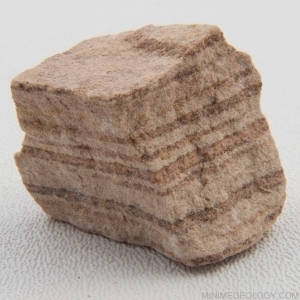 Sandstone is a sedimentary rock composed of quartz grains. This banded sample exhibits bands of red, gray, and buff due to iron oxidation. Sandstone is formed from beach sand-sized quartz grains that are glued together with quartz or calcite. Sandstone is medium-grained and is often associated with underground water and oil storage.